Everybody has feelings -- happy, sad, and even mad. 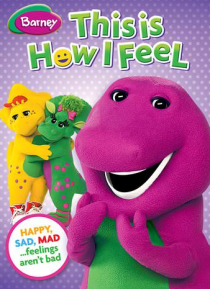 Barney and his friends have a tee-rific time exploring different types of emotions. Baby Bop learns what to do when she is angry, while BJ fixes a big mistake with help from his friends. And Riff's happiness machine gives everyone the giggles. With favorite songs and stories, Barney is sure to turn frowns upside down!